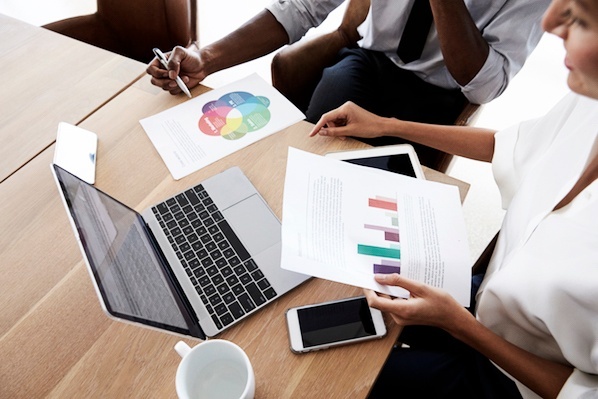 There’s no doubt that content marketing can boost your brand awareness and improve public sentiment towards your company and its product offerings. But for you to really make an impact on your business, you need to know whether you’re getting a good bang for your marketing buck -- and that means you need to figure out how much you're affecting the business' bottom line. Tracking the return on investment (ROI) of your content marketing efforts isn’t always an easy process, but there are ways to approximate the dollar value of each content piece you create with varying levels of complexity. Below, I’ll show you one process I use, as well as describe a few opportunities to go more in depth with your ROI calculations. I hope you find this tutorial helpful when it comes to maximizing the impact of your content campaigns. Step #1: Install the Toggl Chrome App. The first step towards measuring return on investment is to figure out what your investment is. And the first step of measuring investment is to determine how much time it takes to create your content piece. Currently, this integration is only available through the Chrome browser and it’s unclear if support will be added in the future for other browsers. Toggl is just one tool you can use, though -- you can try out other tools that will get the same result. Step #2: Track content creation time using Toggl. Once you’ve installed the plugin into your browser, you’ll see Toggl’s time tracker icon appear in various locations on any of the programs listed above. 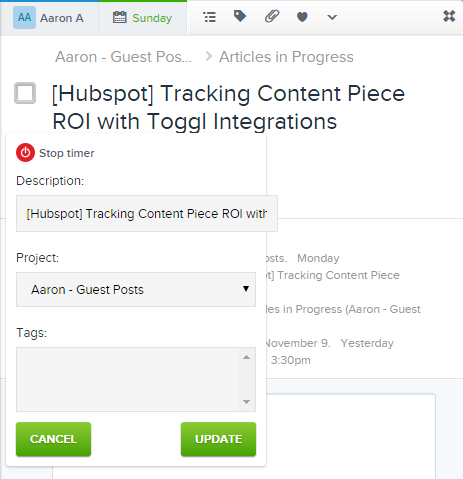 Clicking the button brings up a pop-up window that allows you to set the “Description,” “Project,” and “Tags” to be added to your tracked time session in Asana: Fill these fields out so that it’s clear to you which content piece you were working on when you view your Toggl reports later. Once you have the browser extension installed and your projects set up in Toggl, simply click on the button whenever you’re working on a particular content piece. However, keep in mind that, for this process to work, you need to be diligent about tracking your time. If you work for 10 minutes and then get distracted -- even just for a few minutes -- stop the timer and restart it when you resume working. I’ll show you why this is so important later in this article. But for now, let’s assume that you’ve just finished working on a new blog post for your website and that your Toggl entries show you spent 2 hours and 30 minutes on it. You hit publish, and then a little while later (a few weeks or months or however long your sales cycle is), you need to go back to measure how much revenue you've generated. Step #3: Figure out which metric you'd like to track and how you'd like to measure it. To determine return, you first need to know what metric you’re tracking and how you’ll quantify the metric’s impact. Let’s look at an easy case and a hard case to see how you might approach this calculation. First, suppose you have an online website that sells a single book and that the metric you’re primarily interested in is revenue from sales. To accomplish your goal, you include a call-to-action (CTA) at the end of your blog post leading to a sales page. Using your website's analytics, you’re able to determine how many people go from your blog post to your sales page and wind up completing purchases. In the first week after your blog post goes live, this shows you that you’ve made 15 sales at $30 each, for a total of $450. That example is pretty straightforward, but unless you’re selling a single product where the value of each transaction is consistent, chances are your own revenue calculations will be a bit more complex. 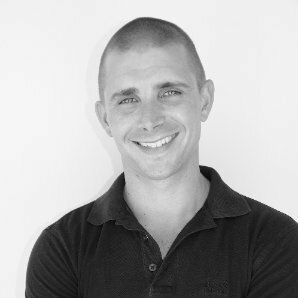 As a second example, let’s say you run a swimming pool installation business and that, instead of generating sales, you’re focusing more on the number of leads your content marketing campaigns create. In this case, you can track the number of leads generated by your specific blog post if you have a lead gen form embedded in the post (or a CTA directing readers to an landing page form). You can then either base your ROI calculations on lead generation metrics or translate these numbers into revenue figures. This can be accomplished by tracking the specific number of leads that go on to become closed sales (and the revenue generated by each sale) or by estimating your total revenue by multiplying the number of leads you’ve generated by your average conversion rate and your average lifetime customer value. For the purposes of this article, let’s assume that your blog post generated 15 leads, one of which went on to become a closed won opportunity with a value of $10,000. Although this could be a stopping point in generating your content piece’s return, it’s important to note that the question of attribution clouds both of these cases. If you sell big ticket items like swimming pools, there’s a good chance that your sales process includes multiple steps -- like an email marketing campaign, a sales call and even an in-person consultation. Heck, even if you’re just selling a single book, it’s likely that other factors -- like your social updates or other website content -- contributed to the buyer’s final purchase decision. As a result, that full $450 or $10,000 likely can’t be attributed to your blog post alone. However, there are several different ways to mitigate these complicating factors. You could simply use the “last touch” attribution principle, which assumes that the final step a buyer took before purchasing was the deciding factor that receives full credit for the conversion. In the examples above, this would give the blog post full credit for sales of both books and swimming pool installations. 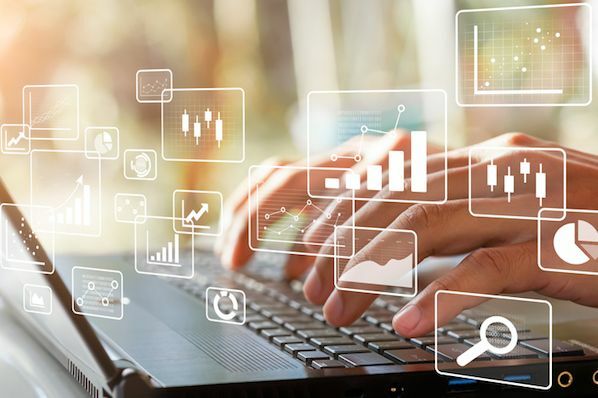 Or, you could get more complicated by tracking the steps in the buying process and attributing a portion of revenue generated to each step according to its relative importance (called “multi-touch attribution reporting”). While it isn’t likely that each step carried equal weight in influencing the purchase decision, this process at least attempts to correct the issues that are inherent in final touch attribution. The thing about attribution modeling, though, is that there are many ways you can choose to attribute your success. And the last thing I want would be for you to spend more time trying to calculate ROI than actually creating content! So instead of getting too caught up in the particulars, pick the model that makes the most sense for your business, your sales process, and your comfort level in dealing with more complicated calculations -- chances are, your marketing software should be able to help you pick the right one to use, too. For the purposes of this article, let’s assume that you know that your funnel typically has four steps between when a prospect first enters your site and when a purchase occurs. Within the examples above, that means we can attribute one quarter of the total revenue ($112.50 of book revenue or $2,500 of swimming pool installation money) to our sample blog post. Step #4: Translate time invested into money. Now, it’s time to translate the time you put into your content piece into dollars that can be compared against revenue generated. Again, there are a few different ways to approach this depending on the level of complexity you’re comfortable with. The easiest way is to take the amount of money you earn in a year and use that to calculate your average hourly rate. Say you earn $75,000 a year and work 40 hours a week, 50 weeks out of the year. This puts your hourly rate at $37.50. If you spent 2 ½ hours creating your content piece, you’ve invested $93.75, based on your hourly rate. If you want to get more complicated, you can take your business’s operating expenses into account. Suppose you average $100,000 a year in overhead spending across your rent, human resources, training, insurance, office supplies, and other costs. Divided over 50 working weeks and 40 working hours a week, this comes out to $50/hour in overhead expenses. Add the two together ($37.50 + $50) and you’ll get a better approximation of your time. Following with our example, you’ve now got $218.75 into the project. Of course, you’ll also want to add in any fees associated with the content piece itself. If you spent $20 to have a graphic designer create a quick intro image, your total goes up to $238.75. Note: This is where it becomes obvious how important it is to track your time properly. Tracking even 15-20 minutes of time incorrectly can really throw your estimations off! Again, none of these calculations are perfect. If you have other employees working for you, for example, they would ideally produce some value that offsets the proportion of the overhead expenses that can truly be attributed to your content marketing work. But the key here is to avoid getting caught up in the nuances -- a rough estimate of the monetary value of the work you’ve put into your content piece is sufficient. Step #5: Measure your ROI. Finally, it’s time to come up with overall ROI. In the case of our book sales, we’ve created $112.50 in revenue at a cost of $238.75. Dividing the benefit by the cost gives us an ROI of -53%. 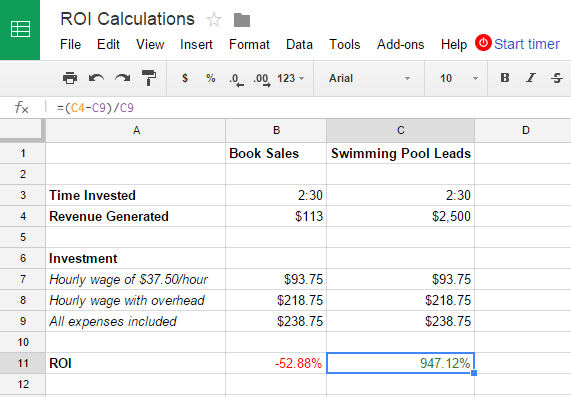 On the other hand, in our swimming pool installation example, we’ve generated $2,500 of revenue at a cost of $238.75. In this case, our ROI is nearly 1000%. So what can you do with this information? Say you make it a priority to check the ROI of five of your content pieces each month. That should give you enough data over time to identify the winners and losers of your content campaigns. Look for trends among your best performing pieces and your weaker ones. Are they all the same format (for example, video posts versus text blog posts)? Do they touch on the same subjects? Do they reach buyers at the same stage of the purchasing process? Use this information to make informed decisions about the future of your content campaigns. If our book seller found consistently higher ROI from video posts than from text-based blog posts, he should focus on delivering more video clips. Similarly, if our swimming pool installer sees lower returns when sharing audio interviews on his blog compared to the success of his text-based blog posts, he should adjust his approach unless future ROI calculations suggest otherwise. Knowing the ROI of your content marketing efforts -- even if all you can get is a best guess -- gives you power. It gives you the ability to structure your campaigns so that you’re not wasting time creating content that doesn’t serve your business objectives. And if you’re a content marketer on a larger team, it gives you the confidence needed to sell the results of your hard work to your manager and other higher-ups. 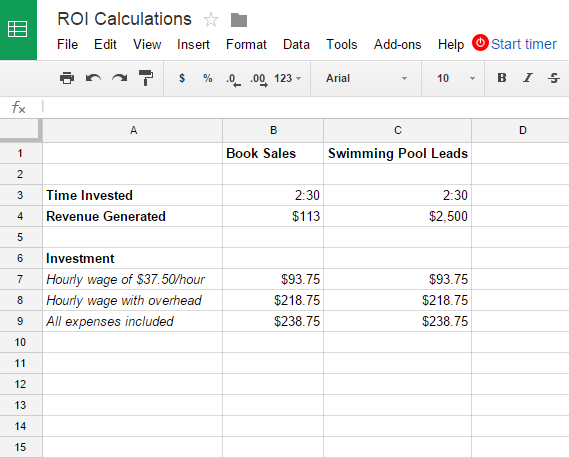 If you haven’t already tried calculating content marketing ROI, give it a shot today. Then, come back once a month for at least 4-6 months to generate the data needed to make meaningful improvements to the success of your content campaigns. 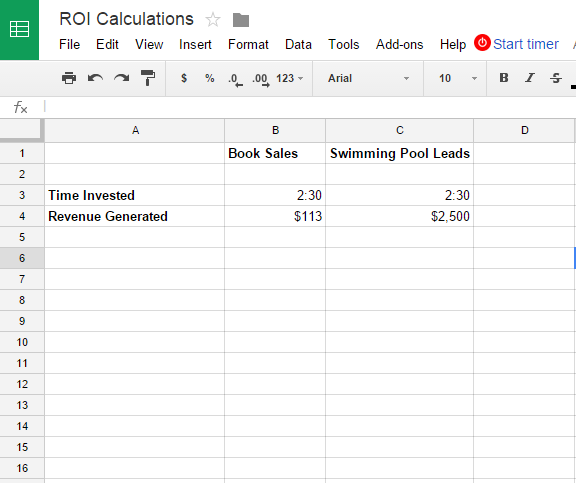 Do you track the ROI of your content marketing pieces? If so, share the approach you use in the comments section below!